Below you will find the lastest JD Power stats that I personally found very interesting. 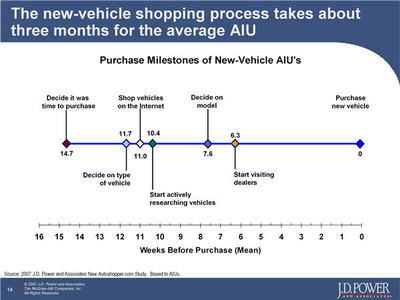 As you read the three lines and look at the graph below, ask yourself if your current follow up process fits the new-vehicle shopping process? "So let’s look at the shopping process. 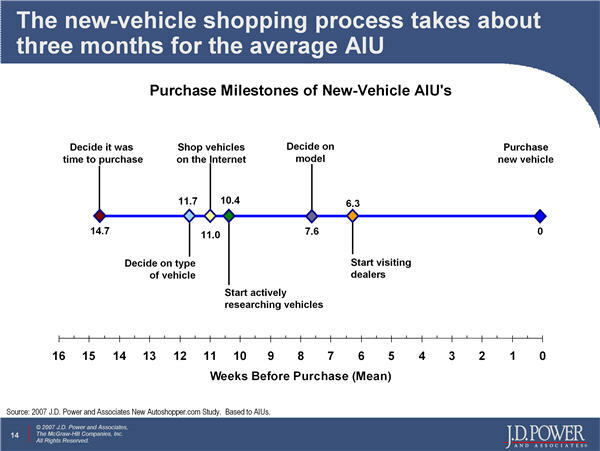 For the average NVB, the entire shopping takes ~ 4 months". "Go online and begin intense researching ~ 3 months before purchase"
"Start visiting dealers about one month later – 1 ½ months before purchase"
"But what’s surprising is that so many companies are still betting against the net, trying to solve today’s problems with yesterday’s solutions. The past few years have taught us that business models based on controlling consumers or content don’t work. Betting against the net is foolish because you’re betting against human ingenuity and creativity". Wow, does that ever ring true with the car business! I think we can all agree that Eric Schmidt of Google knows what he is talking about and we should read that quote over and over until it sinks in. Are you one of those companies? On the surface many of you would say no. But is that totally true? Are you trying to solve todays problems with yesterdays solutions? Are you still trying to control consumers? What are you doing about the Internet? Waiting for it to change or go away? Is your floor traffic down and Internet up? Are you working on growing your Internet sales or floor sales? Have you given your Internet Department the tools that they need? The training they need? Do you send your Internet salespeople to training like you do your floor salespeople? Do you give them the decision making abilities that they need to have? Do you quote prices over the Internet? Payments? Trade numbers? Are you too worried someone is going to shop you? Are you still trying to "control consumers or content"? Do you have "yesterday’s solutions"? "Betting against the net is foolish because you’re betting against human ingenuity and creativity".